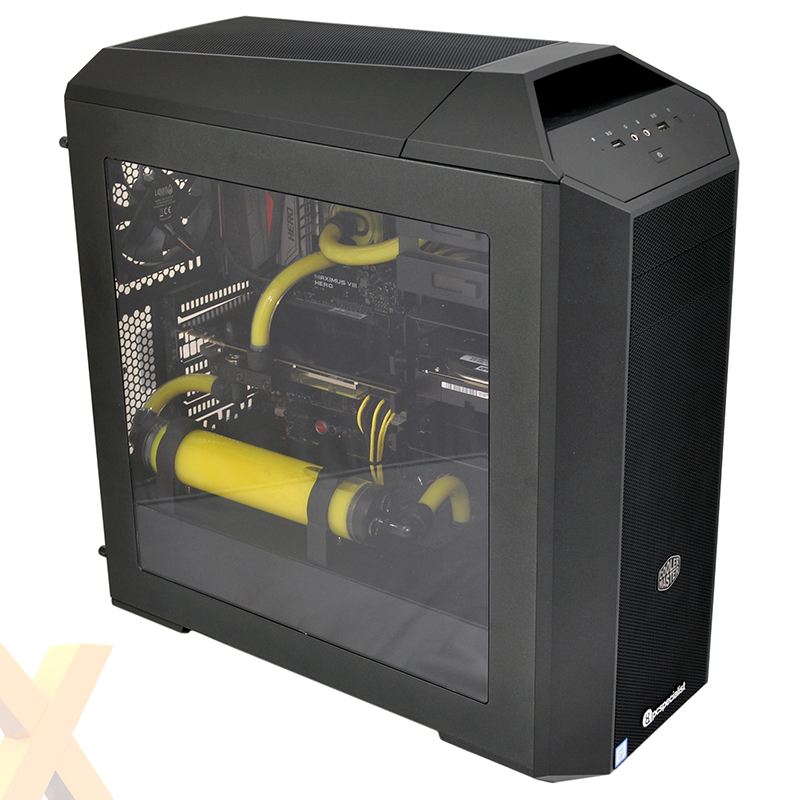 PC Specialist has established itself as one of the UK's premier system integrators, and having built up an extensive catalogue of custom laptops and desktops, the Wakefield-based outfit is now looking to become a first choice provider of liquid-cooled gaming rigs. The firm announced such plans back in April with the launch of a new range of machines under the Liquid Series banner, and to get a better feel for what's on offer, we have in for review an LS-M01 base unit priced at £2,299. 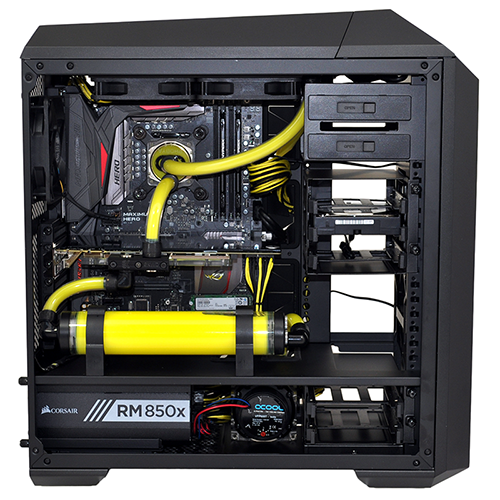 Let's start with the obvious: isn't building your own liquid cooling loop half of the fun? For enthusiasts and DIY fanatics that's certainly the case, but there are going to be plenty of people with cash on the hip that want a powerful, liquid-cooled rig without any of the hassle. Picking the right parts, putting it together and making it look smart can be a time consuming process, and PC Speciliast is providing an option for those who want the benefits of liquid cooling without the hard work. Such systems tend be all about customisation and unique aesthetics, and PC Specialist appreciates the importance of design through a number of configuration options. To start with, all Z170 or X99 Liquid Series machines will be available with a choice of Entry, Mid, High or Extreme cooling kits. Entry includes an Alphacool ST30 240mm radiator, an Alphacool Pro 15 reservoir, a Phobya UC-2 CPU block and a Phobya DC21-260 pump. At the top-end of the scale, the Extreme kit provides dual EK-CoolStream PE 360 radiators, two UK X3 250 reservoirs, an EK Supremacy Evo CPU block and a pair of EK Xtop Revo D5 pumps. High-end stuff from quality component manufacturers, and once you've chosen your desired level of cooling, there's a rainbow of colour options. The customer can select not only coolant colour, but also the colour of the braided cables as well as any internal LED lighting. It's an easy way to get a pimped-out rig, and there are enough case/colour combinations to ensure that your Liquid Series build will remain unique. Our review sample, dubbed LS-M01, adopts a Cooler Master MasterCase Pro 5 chassis and the 'Mid' Liquid Series cooling kit. This is comprised of an Alphacool XT45 240mm top-mounted radiator, an Alphacool Pro 25 250mm reservoir, a Phobya UC-2 CPU block and an Alphacool D5 pump tucked neatly into the chassis' PSU compartment. In addition to all that, the GPU is brought into the loop courtesy of an EK FC Nickel GPU block and a full-coverage EK backplate. 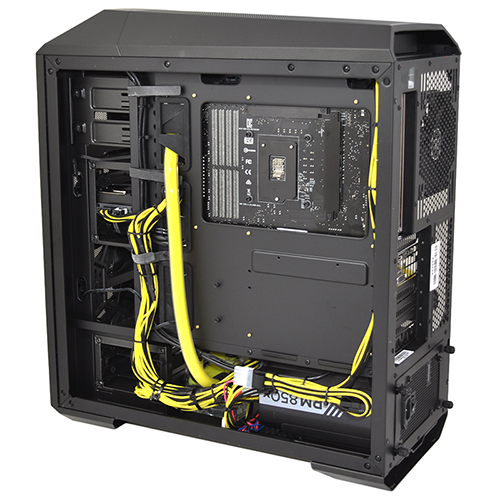 Providing the extra bling, PC Specialist has opted for yellow coolant and matching braided cables, with white LED lighting to keep it all looking bright and visible. It's an eye-catching thing and build quality is decent throughout. The only slight niggle with this particular configuration is the positioning of the reservoir - it obscures the bottom portion of the motherboard, making it tricky to access the M.2 slot as well as the onboard power and reset switches. Might we have preferred the reservoir to be mounted in place of the storage column? Perhaps, albeit at the expense of the two optical bays. Either way, LS-M01 has the ultra-high-end appearance you'd expect from a machine with a custom liquid loop, and there are plenty of powerful components to match. Underneath the CPU block there's an Intel Core i7-6700K processor overclocked to 4.6GHz and sat atop an Asus Maximus VIII Hero motherboard. 16GB of Kingston HyperX Fury DDR4-2666 memory is installed as standard, and graphics are provided by an EVGA GeForce GTX 980 Ti Superclocked ACX graphics card. A potent mix, though the timing is unfortunate - in a couple of weeks this same machine will no doubt be armed with GeForce GTX 1080. Everything else is as you might expect for a system of this ilk. Storage is provided by a 512GB Samsung SM951 PCIe M.2 SSD, with a 2TB WD Black on tap for secondary purposes, and Corsair's RM850x PSU provides the juice. PC Specialist's tubing and cable management is tidy, and for those of you who crave the details, the CPU overclock is applied via a 110 base clock allied to a 42x multiplier across all cores. Voltage is manually set to 1.3. Having the CPU and GPU liquid cooled without having to lift a finger is part of the appeal, and the three-year warranty offers genuine peace of mind. PC Specialist offers free collect and return for the initial month, parts cover for the first year, and labour for the remainder. Looking ahead, there's also an optional £149 service pack that can be purchased at any time. For the fee, PC Specialist collects the system, drains the loops, flushes and cleans the pump, block, reservoir and fittings, before replacing all the tubing and filling it with new coolant. There's then a 24-hour leak and stress test before the system is returned to the user. The only obvious catch thus far is that, as always, the £2,299 promotional price only applies if the reviewed LS-M01 is purchased as configured above, though we do hope customers will be able to substitute a next-generation graphics card at minimal cost. In the meantime all signs suggest that PC Specialist is offering a practical means of entry into the premium world of custom liquid cooling, so let's take a look at performance to see if everything is up to scratch.